Insulin dependent diabetes mellitus is associated with renal failure, diabetic retinopathy, neuropathy and vasculopathy. We report a simultaneous pancreas kidney transplant in a young diabetic with renal failure. This dual transplant has cured his diabetes and renal failure with a beneficial effect on his neuropathy, retinopathy as well as his quality of life. Obstacles to this dual transplant have been a lack of suitable recipients in India as well as a cadaver donor program still in its infancy. 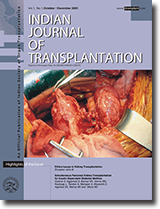 Simultaneous pancreas kidney transplantation is the treatment of choice for such patients. The advent of new immunosuppressive drugs is allowing renal physicians to individualize immunosuppressive therapy. A combination of drugs with lesser toxicities especially lower nephrotoxicity with better renal function should result in longer graft and patient survival and reports are already beginning to show that. The emphasis should be on minimizing toxicity of individual drugs and hopefully this should allow to lessen or prevent morbidity associated with the older immunosuppressive drugs. The areas of interest would be minimizing the calcineurins and steroids with the increasing use of the monoclonal receptor antibodies, proliferation signal inhibitors and mycophenolate. The only deterrent seems to be the prohibitively exorbitant cost of the newer immunosuppressive drugs. Various generic forms available in the country has allowed the cost containment to some extent. However what needs to be done is to develop evidence for various cost effective protocols for live donor transplants. Post-transplant lymphoproliferative disorder (PTLD) is a serious complication and we diagnosed PTLD in 5 of 659 renal transplant recipients operated and/or followed up by us between 1997 through 2005. Immunosuppressants included mainly Cyclosporine, Azathioprin/ Mycophenolate mofetil and Prednisolone. Focus of study was mainly to find out disease incidence, precipitating factors and co-morbid conditions, presentation and diagnosis, treatment and outcome. Total of patients- n=5 (0.8%) developed PTLD during follow up. Three had polymorphic PTLD involving GI tract, while one had large cell Non-Hodgkin lymphoma of peripheral lymph node and Hodgkin's lymphoma of spleen developed in another patient. Time of onset varied from 6 months to 4 years. All had received cyclosporine, azathioprin and prednisolone. One had received anti rejection therapy, one was received more than usual dose of cyclosporine and one with ulcerative colitis had received steroids pre-transplant. All the polymorphic PTLD cases had evidence of active viral infection in the form of +ve monospot/EB viral DNA/viral inclusion bodies. One patient with polymorphic PTLD had history of ulcerative colitis and mild (? Congestive) splenomegaly was present form the beginning in one with Hodgkin lymphoma. The chief presenting features were GI bleed/mass/perforative peritonitis 3, large splenomegaly in one and peripheral lymph node enlargement in another. Immunosupression was withdrawn/drastically reduced in all. Two patients with lymphoma needed chemotherapy, but expired because of severe marrow suppression and infection. One of the rest 3 with polymorphic type died in immediate postoperative period because of sepsis related to perforative peritonitis. Other two survived though one gradually lost his kidney due to chronic rejection and is back on dialysis. Post transplant lymphoproliferative disorders represent a heterogeneous group. Those with polymorphic histology and evidence of active EB viral infection are best likely to respond to immunosuppressant withdrawal.